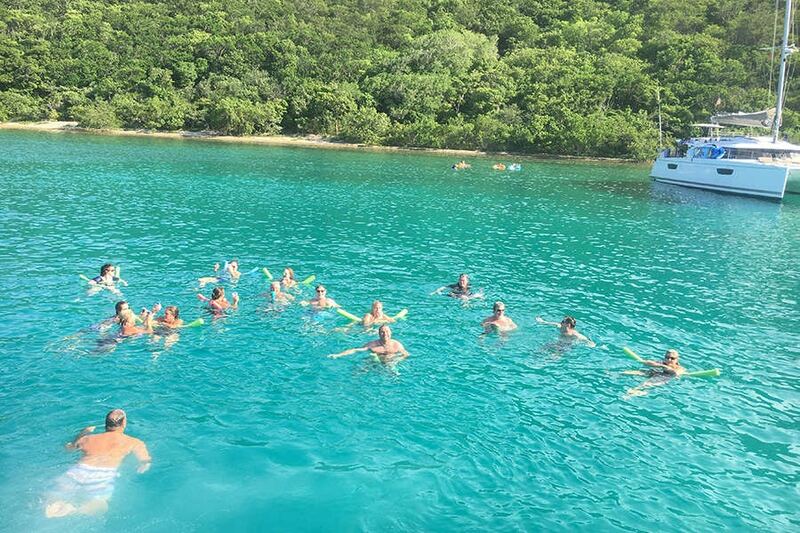 We specialize in family-friendly full day boat charter rentals that take advantage of all that St. John and St. Thomas offer, without the added expense and time it takes to cross into the British Virgin Islands (BVI). However, if that’s your dream, we will make it happen! There’s no one that knows more of the best spots than us. Charters are typically 8 hours starting at 8:30 am and ending at 4:30 pm, however we are flexible if you have something different in mind. Fuel consumption is additional and will depend on the chosen destinations and the current price per gallon– usually between $175 and $220 per trip. Lower fuel rates would be for days spent around Jost Van Dyke and Tortola. Higher fuel rates are for Virgin Gorda trips – the furthest destination we visit in a day. Virgin Gorda trips will be around $300 and $325. Fuel cost is calculated with our digital gauges. If you are planning a trip to the British Virgin Islands each guest will need to have a valid passport. British Customs is $60-65 per person depending on the number of people and if its a Sunday or Holiday. Also, please note the authorities only accept cash. This will be due upon boarding your charter with us. We hold reservations with a credit card per our cancellation policy: No deposit is necessary. We charge ½ price if you cancel within 48 hours of the charter. It is recommended that you reserve your day on the water prior to coming on vacation, especially between November and July. Payment is due at completion of the trip. We accept Cash, Visa and MasterCard. The $150 Captain Fee portion of your trip should be paid in cash directly to your captain. Finally, as in all of our service industry businesses in the islands – tipping of the captain for outstanding service is greatly appreciated. Standard gratuity in the industry is 15% to 20% of the boat fee and captain fee if you feel its been a job well done. Great Rates, Incredible Times! Ready to Get Started? We’ve got one flat rate, but our trips are infinitely customizable to make your dreams of a day in paradise a reality. Just contact us today and let’s start planning your unforgettable adventure!